Commuting from a bicycle is one of the most eco-friendly decisions you can make. In case, no one excepts you in your locality commutes by bicycle, don’t worry about looking odd. There are many super cool bikes that would help you in standing out from the crowd. 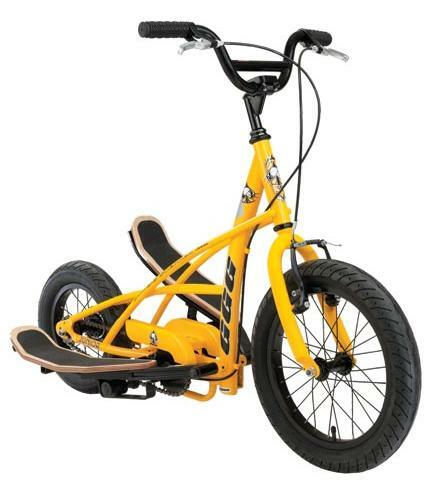 You can opt for any of the following innovative bicycle designs and make a style statement. To be honest, I would have to admit that nothing is what it used to be like before. Everything around the world, living or non-living, non-living especially, is getting a facelift. Take for example, bicycles. We all know that bicycles are extremely good for not just kids but for grown-ups as well. It helps you get the much-needed exercise and gives you a chance to admire the virtue of roaming around and getting some fresh air in the meantime. Like I said, so many things have gotten a facelift. Naturally, bicycles of today are different from the ones we used to ride. Let us take a look then. 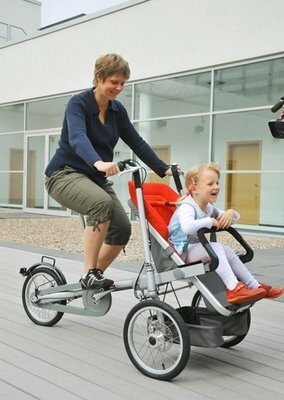 The idea is simple; instead of taking your small kid outside in a pram while walking, purchase this bicycle and get to pedal while our kid and you enjoy some activity. Yes folks, the next choice for a unique purchase for bicycles will be to buy this bike, which comes with a spacious bag where you can store goods. 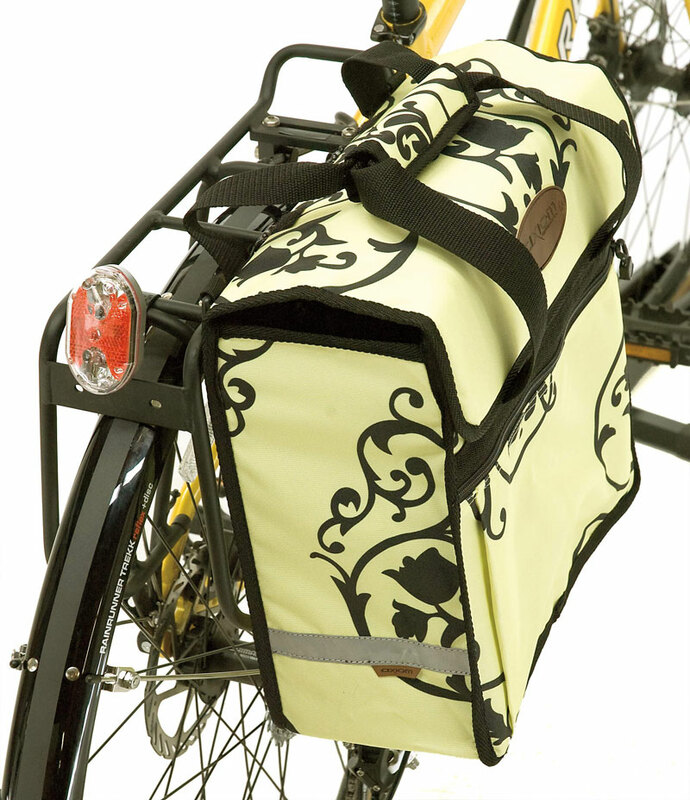 Ideal for a day out on your bicycle or even for running daily errands. Yep, you guessed it right! 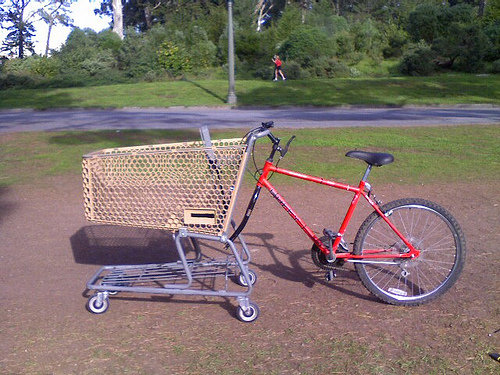 This darling of a bicycle takes after carts used for shopping in a departmental store and comes with brakes and wheels. Of course, there is plenty of area for your rear end. This is the best choice for those who love to lose those extra pounds by working out. 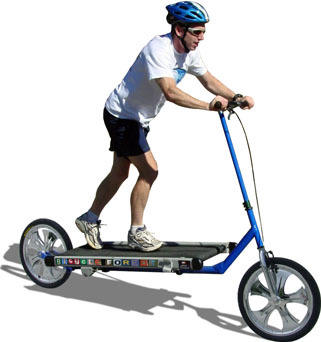 You can call it a bike, which needs you to stand and pedal. This unique design is for those who are fussy about security. 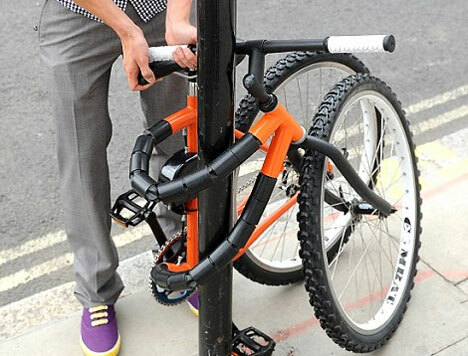 The frame bends easily in order to make it easy to lock the bike around a solid stand. Be outdoors and yet do the rounds of your treadmill. Unique, I would say and effective. If you carry, a lot of heavy stuff around, this should be your choice what with plenty of space and capable of holding around 120 kg and more. 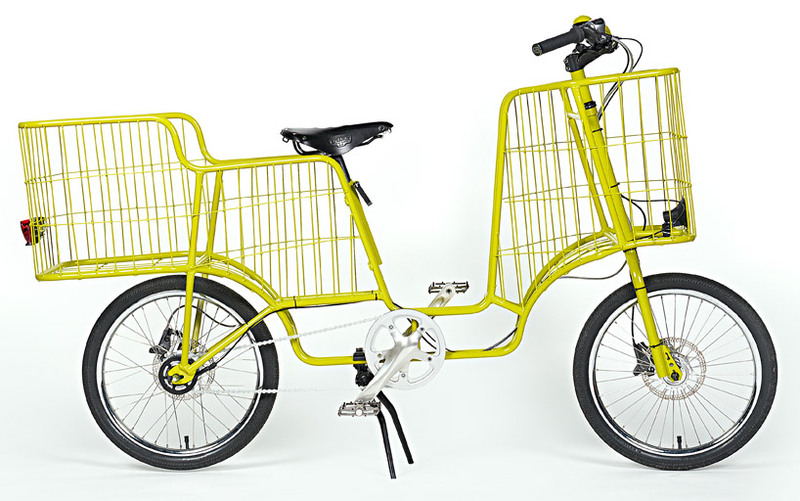 Designed by Asians, this bicycle is a cute model, the wheels of which look more like an automated vehicle. 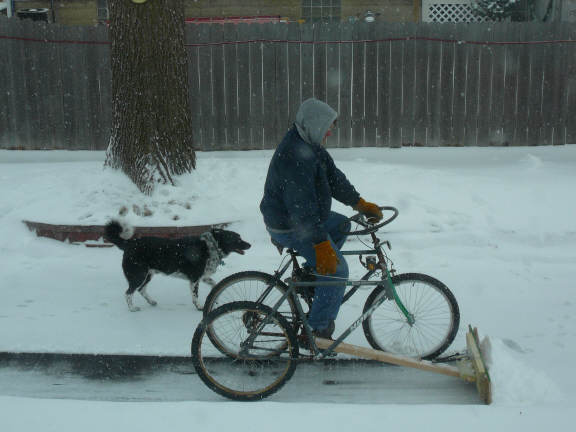 As the name suggests, this bike comes with a snowplow and is complete with three wheels and a sidecar. Yes folks, it has finally been invented. 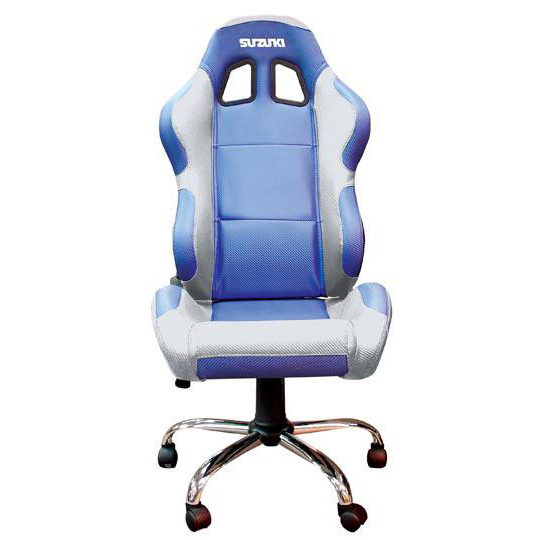 Now you can ride along and yet be comfortable in a plush office chair. We have already covered a number of portable bike designs in the past, but the one that I am posting right now is perhaps one of the most unique bike concepts we have covered lately. Inspired by the uniqueness and popularity of the Apple products, designer Jake Foley has come up with an innovative bike that will incorporate latest technology in a neat and clean design. 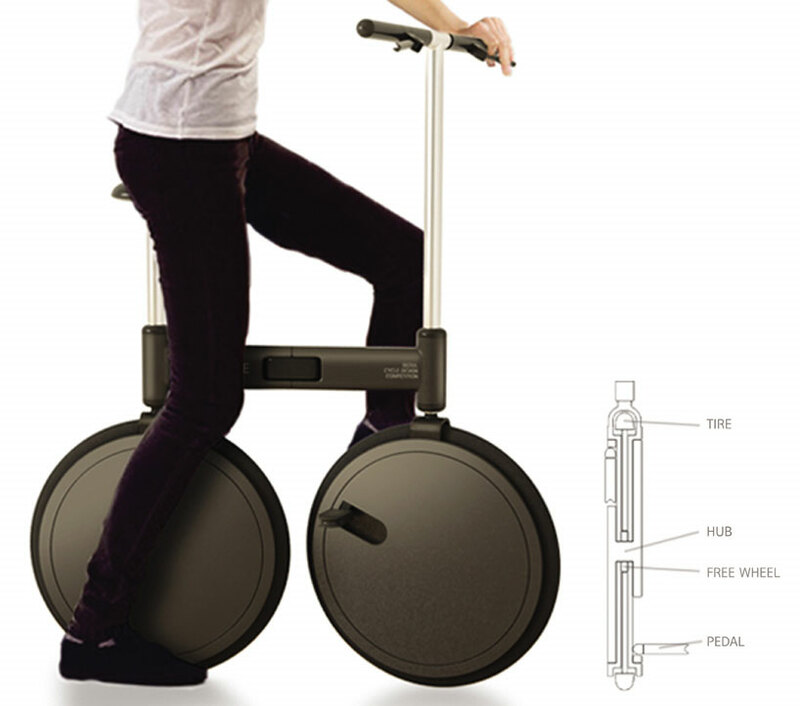 Essentially intended for the young urban bike riders, who need technologically sound transportation to move around, the Apple bicycle includes an iPod scroll wheel to place or possibly charge the PMPs, laptop case for notebook, and magnetic wheels to make commuting quick and effortless. Powered by hydraulic fluids, the bike doesn’t require chains, and easily folds into a compact size to be carried inside a building. 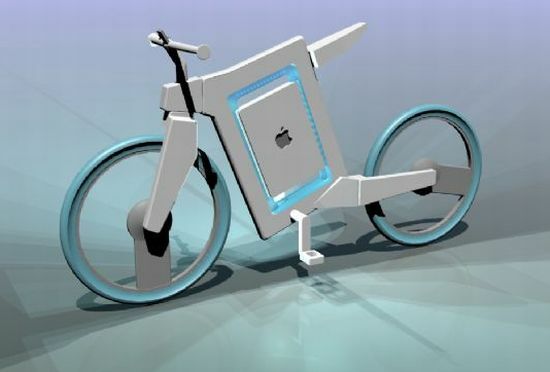 The Apple bicycle is truly a stylish vehicle that not only incorporates modern technology but also helps the commuters play their part to support the eco drive going on across the world. 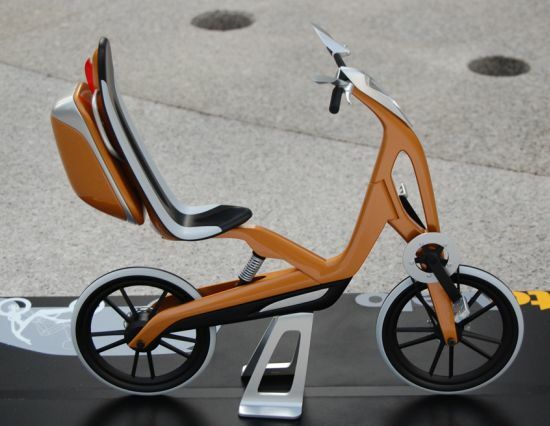 An award winning entry at the 2010 International Bicycle Design Competition, the “AutoVelo” by American designer Eric Stoddard is an electric assist bike that presents an automotive seating position to make it more comfortable and convenient for the rider. Persuading car owners to use pedal-powered, eco-friendly vehicles, the latest bike locates the seat over a saddle while maintaining over the foot and hand positions to allow the comfort of riding the car. If you are too tired to pedal the bike, it also integrates a small electric engine to move you briskly and effortlessly through packed city roads, while the single suspension underneath the seat ensures fewer bumps in comparison to other electric bikes available. With time, bicycles have lost their value as now people prefer scooters or motorbikes over them, but still many are doing their best to bring them back over time. Many designers and inventors are offering their creativity to make bikes more innovative and unique. Environmentalists are trying hard to spread awareness by suggesting bikes as the solution to excessive global warming and exhausting oil supplies. 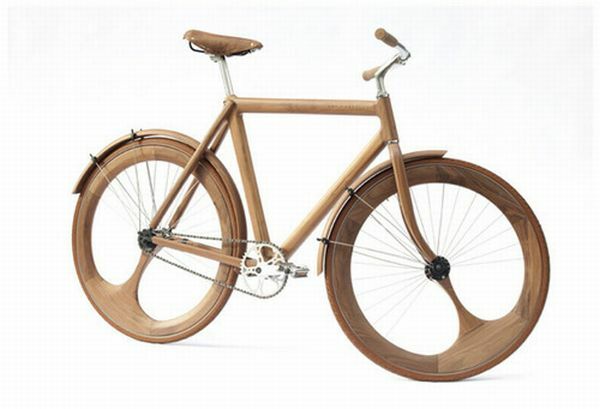 Accordingly, designers came up with incredible biodegradable bikes made out of wood. 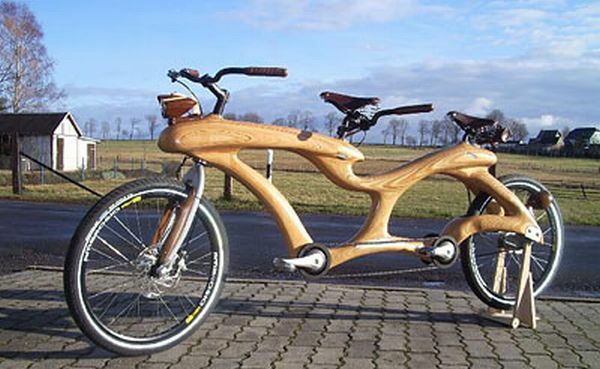 Check out the amazing fully functional bikes made out of wood. You have always thought that bicycle frames are made up of some kind of metal but a student from Germany Jens Eichler, just proved it wrong. He made out the bicycle frames from beech timber and carved with properly. The amazing bike frames used two beech plywood sheets with some tools and a strong adhesive. The bicycle is named as ‘Renovatia’. Everything from gears, the saddle, and all other bike components are from wood. The whole bike is crafted from different combinations of wood, for instance the metal bearing is made from oily ironwood, the full frame and the wheels is made from birch plywood. Several parts are made from recycled wooden product like an old handle of a broom which constituted for handlebars and the Pedals. The trickiest part was the chain and took thousand men to complete this beautiful full functional bike. It can reach to a high speed of 31 miles per hour. Rich people never thought bicycles as their mode of transportation maybe because of the lack of class and elegance. Now, they can try this elegant bike designed for the elite folk of our society. The exclusive bike is crafted from American black walnut with a Lagomorph design. The perfectly designed bike is highly efficient combined with high performance as well. The breaks are from Diacomp. And the pedals are from white Industries. Yes its quite expensive but worth its price. Weremkowicz is the solo creator of many fully functional bikes. The bikes are perfectly carved and chiseled, which is a real treat to the eyes as you can’t take your eyes off. The bikes are made from different types of wood and recycled wooden materials. 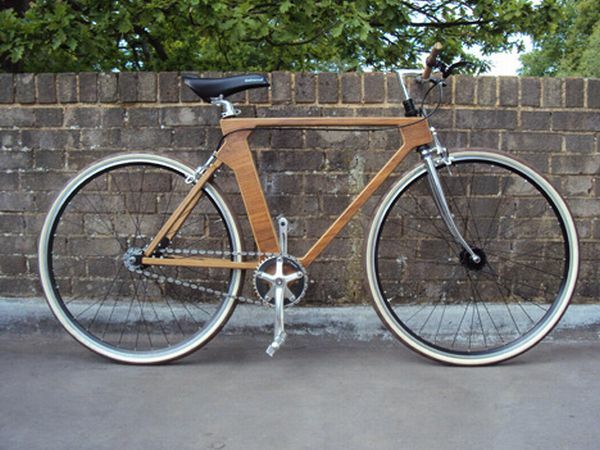 If bikes are your style, then the sleek wooden bike launched by Flat Frame systems is ideal for you! The frame is quite shiny with a glossy touch as it is covered with best quality veneer polish. The unique quality of the bike is that it uses hollow tubes made from a flat material.